Pawsitively Good Pup uses balanced training techniques which focuses on rewarding good behavior but also employes mild corrections when needed. This approach supports confidence, trust and relationship building while still setting boundaries and structure for the dog. PGP recognizes that dogs and their owners are individuals and that one size does not fit all. Consequently, the tools and techniques used will be the ones best suited to the individual. We do not take a “my way or the high way “ approach to training. We want the owner to feel comfortable with the procedures and the dog to be set up to succeed. Cindy Hoppes is the owner/trainer for PGP. 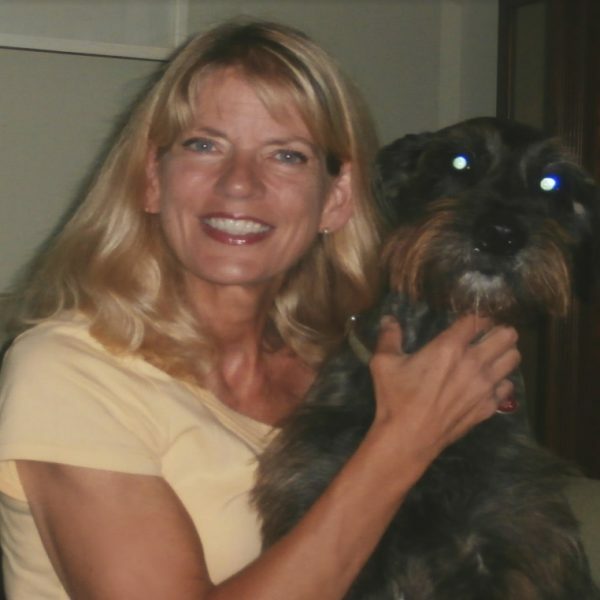 She started her career in pet services in 1999 with a Pet sitting and dog walking service. In 2006 she established Pawsitively Good Pup dog and puppy training after doing an internship with Michelle Blount a trainer who specialized in Rottweiler and Belgian Shepherds. Cindy is certified through IACP (International Association of Canine Professionals) and Pet Tech in pet first aid. She is a certified Trick Dog Instructor and an AKC Canine Good Citizen Evaluator. She believes strongly in continuing education and attends many seminars and workshops with a view to learning the best ways to help improve the lives of dogs and their owners. Cindy has a BS in Psychology for The Ohio State University and a Masters degree in labor relations and human resources from Cleveland State University. She is married and currently has one dog, Mr. Orson who is a standard Schnauzer mix that she adopted from Bright Futures rescue. She is interested in Canine Freestyle, Nose Work, stunt dog and Parkour dog sports.